Hong Kong is located in the Far East, just south of the Tropic of Cancer. Hong Kong Island is 32km (20 miles) east of the mouth of Pearl River and 135km (84 miles) southeast of Canton. It is separated from the mainland by a good natural harbour. Hong Kong Island was ceded to Britain in 1842 by the Treaty of Nanking; and the Kowloon Peninsula (south of Boundary Street and Stonecutters Island) in 1860 by the Convention of Peking. The area of Boundary Street to Shenzhen River and a group of 260 islands, now known as the New Territories, were leased to Britain in 1898 for a period of 99 years. The New Territories (plus the 260 islands) comprise 891 sq km (380 sq miles). 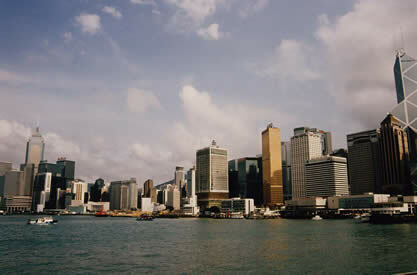 Shortage of land suitable for development has led to reclamation from the sea, principally from the seafronts of Hong Kong Island and Kowloon. Area: 1097 sq km (423.6 sq miles). Population Density: 6,096 per sq km. Hong Kong is 13 hours ahead of New York, 14 hours ahead of Chicago, and 16 hours ahead of Los Angeles. Since Hong Kong does not have a daylight saving time, subtract one hour from the above times if its summer. Because Hong Kong is on the other side of the international Date Line, you lose one day when traveling from the United States to Asian. Dont worry-you gain or back when you return to North America, which means that you arrive back home the same day you left Hong Kong. Government: Special Administrative Region of the Peoples Republic of China since 1997. Head of Government: Chief Executive Tung Chee-Hwa . Religion: Buddhist, Confucian and Taoist, with Christian and Muslim minorities, but there are also places of worship for most other religious groups. Telecommunications services are as sophisticated and varied as one might expect in an advanced Western-style economy (including radio-paging and viewdata). Directory enquiries services are computerised. For directory enquiries, dial 1081 (English) or 1083 (Chinese). Full IDD is available. Country code: 852. Outgoing international code: 001. Local public telephone calls can be made either with phonecards or coins. Local calls are free from private phones. GSM 900 and 1800 networks provide coverage on the mainland and throughout the island. Mobile telephones function all over the underground network, thanks to transmitters installed in the tunnels. HK Telecom International Ltd and the post office provide services. Bureaufax and international services are also available. There are 2 English-language channels offering programmes from abroad. Satellite TV is provided by STAR TV. English-language programmes can be heard on Radio 3 (567kHz), Quote AM 864 (864kHz), Metro Plus (144 AM), Hit Radio (99.7 FM), FM Select (104 FM) and BBC World (675 kHz). The three dailies in Hong Kong include the South China Morning Post, The Hongkong Standard and Eastern Express (except for Sunday). You can also get business-related publications such as the Asian Wall Street Journal and International Herald Tribune as well as foreign publications (Time, Newsweek, etc) at hotels and newsstands around town.